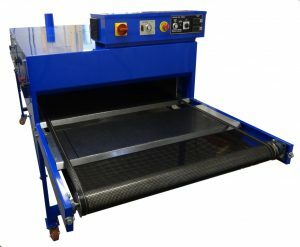 Like the 8220 Texitunnel the 8230 Texitunnel has been very popular with printers who use 2 hand carousels or have an automatic carousel printing mainly plastisol prints on t-shirts at rates of about 600+ t-shirts per hour. It will also dry and fix waterbased inks like “Texiscreen” in 1 pass at rates of 150 to 300 shirts per hour depending upon the print area.This is fast enough for a hand printer printing water based inks. The 8230 has heating elements that are 50% wider (78cm) than the 8220 model. This makes it easier to use with large pieces.